Natalie Pai and Fritz San Tino in their winning Intermediate-I Test. ©SusanStickle.com. Wellington, FL – March 24, 2019 – The eleventh week of the Adequan® Global Dressage Festival (AGDF) featured national competition from March 22-24. CDI Competition will resume for Week 12 on March 27 and will feature the “Friday Night Stars” FEI Grand Prix Freestyle CDI4* presented by Douglas Elliman Real Estate on Friday, March 29. On Saturday, March 23, Natalie Pai (USA) and Fritz San Tino won the Junior/Young Rider section of the FEI Intermediate I* presented by Peacock Ridge, with a score of 73.676%. “I’m really excited. It’s the highest score I’ve ever gotten on him,” said Pai of her winning test on her 17-year-old Hanoverian gelding by Falkenstern II. “I think he had a lot more energy and better through-ness [than yesterday]. I’m really happy with him. The 21-year-old discussed what she plans to work on moving forward with her partner of four and a half years. “I want to work on the canter pirouettes a little bit more [and] to work on the rideability in the ring itself, and just keep the power and the energy but still keeping him relaxed and rideable,” said Pai. Pai is thankful to her parents and to her coach Adrienne Lyle for supporting her. “This was my last show of the Wellington season, so I’m happy that we went out with a bang,” concluded Pai. In the Open FEI Grand Prix* presented by Wellington Equestrian Realty, Krystalann Shingler (CAN) and Fidelio, her 11-year-old Oldenburg gelding by Fidertantz, rode to a win with a score of 73.696%. Kerrigan Gluch (USA) and Vaquero, a 16-year-old P.R.E. stallion owned by Hampton Green Farm, captured the win in the FEI Intermediate II ‘Brentina Cup’ presented by Diamante Farms with a strong score of 73.088%. Wellington, FL – March 13, 2019 – The opening day of competition at the 10th week of the 2019 Adequan® Global Dressage Festival (AGDF) on Wednesday, March 13, featured the Nations Cup CDIO-U25 presented by Diamante Farms with victory for the team from the United States of America. Canada 1 team was silver, and the Canada 2 team took bronze. For the third year, AGDF hosted CDIO-U25 competition, offering a great stepping-stone of international competition for young riders. The team from the USA, consisting of Lauren Asher on West Side, Natalie Pai on Unlimited, and Kerrigan Gluch riding Bolero CXLVIII, finished on a total team score of 138.559 in the FEI Intermediate II 16-25 test, which determined the team medals. Asher (22) originally hails from Denver, CO and she rode the 16-year-old KWPN gelding by Florett AS owned by Select Equine International to a personal best score of 70.471%, which was also the second-highest score in the class. Natalie Pai, age 20, and her dressage trainer Kevin Kohmann, a trainer at Diamante Farms in Wellington, Florida, have a lot in common. They have both broken the industry norm to achieve impressive accomplishments in the sport they love at a young age. Last month, Pai won the Reserve Championship in the Brentina Cup at the 2017 Dutta Corp. U.S. Dressage Festival of Champions in Gladstone, New Jersey aboard Unlimited, a 16-year-old KWPN gelding (Jazz x Clairudith, Winckenburgh) that she is leasing from P. J. Rizvi and Peacock Ridge, LLC. 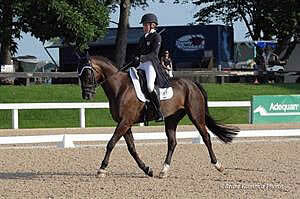 She also competed on Fritz San Tino, a 15-year-old Hanoverian gelding owned by her mother Melanie Pai. Natalie Pai is the youngest competitor in history to bring two horses to compete at the Festival of Champions, and the youngest to qualify for and compete a horse in the Intermediate I division of the Festival of Champions. Like his protégé, trainer Kevin Kohmann started racking up successes at a young age. He is the youngest in history to pass the Bereiter in Germany at the age of 18, the youngest to earn the title of Master Bereiter, and to earn his German gold medal. Pai, who has been serious about the sport of dressage for the past five years, has been working with Kohmann for four years. She followed him to Diamante Farms when he moved there three years ago. “The best thing about Kevin is that he is such a good rider and a good coach,” she said, adding that since she is a visual learner, it’s helpful for her to watch him ride so that she can copy him. “Sometimes, when I don’t understand something, it’s really important for the way I learn for someone to show me how to do it rather than tell me how to do it.” Pai’s mother, Melanie Pai, is also a dressage rider who grew up in the show ring. She agreed that her daughter clicks with Kohmann’s teaching style. The younger Pai said that her mother was probably even more excited than she was when she clinched the Reserve Championship at Gladstone. She doesn’t plan to change trainers any time soon – although recently Devon Kane gave Pai some lessons while Kohmann was competing, and Pai found her time with Kane invaluable. Both Kane and Pai are petite, and the trainer gave the younger rider some valuable tips on how to adjust her technique for her size. The Pais keep five horses at Diamante Farms in Wellington, Florida, and Natalie rides three of them. She keeps busy with her six-day-a-week riding schedule with Kohmann, while also attending Palm Beach Atlantic University, where she is majoring in Business Management. Pai counts herself lucky that she has such a great support system in her parents, Kohmann, and Kane. In fact, she had a fan club watching her at Gladstone, including Kohmann, her mother, father, aunt, and groom Emilija Anderson, as well as friends watching through the live stream. Many who follow the sport of dressage have heard U.S. Olympic icons Robert Dover and Debbie McDonald refer to the “pipeline of dressage” as the future of the sport in America. Riders like Natalie Pai and trainers like Kevin Kohmann and Devon Kane are not only part of that pipeline, but are also encouraging other young equestrians who dream of competing at high levels to ride along with them. Lexington, Ky. – Dressage riders from across the United States and Canada competed for Individual medals at the 2015 Adequan/FEI North American Junior & Young Rider Championships presented by Gotham North (NAJYRC) on Friday at the Kentucky Horse Park. In the USDF/Platinum Performance North American Junior and Young Rider Dressage Championship, it was Helen Claire McNulty (Region 2) who claimed the Gold medal in the Junior division. In the Young Rider division, the Gold medal went to Natalie Pai (Region 3). Endurance riders competed in their 75-mile race on Thursday, and on Friday morning Kelsey Russell was presented with the Individual Gold medal. The Team Gold was awarded to Team USA Southeast. CH-J 1* Junior eventing competition also got underway on Friday with the dressage phase of competition. The top three in the Junior Individual dressage competition all finished within less than one percent of each other, but at the top of the list was Helen Claire McNulty of Region 2. The 15-year-old and her mount, Checkmate, finished the day on a score of 70.816% to claim the Individual Gold medal. “I did [the NAJYRC] last year, and I finished 11th individually and fifth in the freestyle. It’s pretty cool to come back here and win it,” McNulty said. Camille Bergeron (15, Mascouche, Que.) of Team British Columbia/Quebec rode Delfiano to the Silver medal after earning a score of 70.079%. “We train all year to get here. Just to be here and to win is a dream come true. It proves all of our hard work paid off,” Bergeron said. The Bronze medal was awarded to Region 9’s Chloe Taylor (17, Wimberley, Texas) riding Calecto V.
“I’m really pleased with my test and my horse, and I really want to congratulate my teammates because I think everybody did a really, really good job today. All of the tests were beautiful,” Taylor said. On Wednesday Natalie Pai claimed Team Silver alongside her Region 3 teammates, and after Friday’s Individual competition she will also be going home with a Gold. Pai (18, Wellington, Fla.) and Fritz San Tino finished Friday’s Individual test with a score of 69.132% to secure their victory. Fresh off the USEF Young Rider European Tour, last year’s Individual, Team, and Freestyle Gold medalist, Catherine Chamberlain, came into this year’s competition feeling the pressure of returning as the defending champion, and now, she is thrilled to be leaving with another Young Rider medal. She claimed the Individual Silver medal on Avesto Van Weltevreden with a score of 68.711%. Finishing in third and taking home the Bronze medal was Naima Moreira Laliberte (18, Montreal, Que.) on Belafonte. The pair from the team of Quebec earned a score of 68.447%. Team USA Southeast dominated the podium on Friday morning at the NAJYRC. The team took both Team and Individual Gold, while USA Northeast earned Team Silver. Kelsey Russell, 19, of Williston, Fla., rode off with both the Individual Gold and the Best-Conditioned Horse Award aboard My Wild Irish Gold, a 12-year-old Anglo-Arabian mare owned by Valerie Kanavy. Her teammate, Annie Whelan (Louisa, Ky.), won the Style Award. Team medals are determined by the top three highest-placed combinations. The USA Southeast team finished with the best cumulative time of 19:35:15, followed by USA Northeast (20:30:41). In the individual rankings, Russell had the best time of 5:43:56 hours. The Silver medal went to Hanna Weightman (Shamong, N.J.) with Meg Sleeper’s Syrocco Rabia (5:46:07 hours), and the Bronze to Hope Misner (Webster City, Iowa) with Roxi Welling’s GDE Sweete Legacy (5:52:03). Eleven of 14 starters completed the course designed by Emmett Ross, which drew numerous compliments from competitors. “Emmett Ross got us out of the mud, and we’re very grateful for that,” said Whelan. Ross spent the entire day before the race rerouting the course because portions of the original route were belly-deep in water from torrential rains earlier in the week. At the press conference after the awards, there was laughter and tears, particularly when the competitors talked about their horses (three of which are being retired after this event). Among the retirees is My Wild Irish Gold, Russell’s champion mount whom she has been riding for six years and whom will now become a broodmare. The pair previously won this event at the Horse Park in 2011. The three-day journey to the Eventing CH-J 1* (Junior) and CCI2* (Young Rider) medal podiums started on Friday with the dressage phase of the USEA North American Junior and Young Rider Eventing Championship. In the CH-J 1* Team competition, the team from Area II leads the way on a score of 126.6 penalties, while Area VI sits second with a score of 144.8 penalties and Ontario currently rounds out the top three on a score of 146.1 penalties. This year marks Booth’s third time competing at the NAJYRC, and after learning experiences the past two years, she hopes this will be her best one yet. In the CH-J 1* Individual competition, Grover-Dodge on Remington XXV leads the standings with 38.3 penalties for Area II. Booth, also of Area II, sits in second riding Twizzel with 41.8 penalties, and Makenna Rold (15, Delano, Minn.) of Area IV rounds out the top three with 44.9 penalties. In the CCI2* Individual standings, Nicole Doolittle (Reddick, Fla.) tops the leaderboard with 47.7 penalties riding Tops. Paige Pence (Louisville, Ky.) sits in second on Class Action with 59.6 penalties. Diane Portwood (Marietta, Ga.) and Cinerescent round out the top three on 60.5 penalties. The CCI2* will not be competing for FEI medals and the team competition is not being held this year due to insufficient international entries. Eight horses competed in the Farewell class in the Walnut Arena on Friday morning with Zone 2’s Lucy Matz (Coatesville, Pa.) and Cardella topping the field. The pair posted the quickest clear jump-off round in a time of 38.42 seconds. Finishing just behind Matz were Zone 9’s Jennifer Gates (Medina, Wash.) and Cadence in second, while third went to Canada’s Ashlee Steffens and Braveheart de Muze. USEF Network presented by SmartPak will live stream the entirety of Saturday’s events from the Rolex Stadium and Stonelea Ring during NAJYRC. Visit www.usefnetwork.com to tune in and to find out more.